A man screws up at his job as a mortician and is fired as a result. When he goes back inside to retrieve something he forgot, he finds that his former boss is dead on the floor after being brutally murdered. 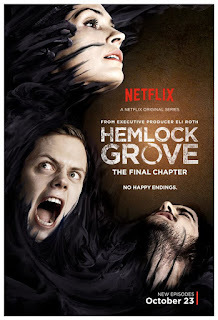 This is Hemlock Grove after all, so it's probably the same monster that's been introduced in the season premiere as the one hunting down people and attacked Roman in his home. Roman checks the spare bedroom where he had allowed Annie to stay but finds she's gone. She later reveals herself as not having left but was simply taking a shower. The two discuss the monster that attacked him the night before. Annie wants to go back to her hotel but Roman first asks her how she feeds and what she does with the bodies. She says she doesn't have to kill anyone and seems surprised that no one had taught him how to live and feed in the modern world. She shares how most Upirs work in professions that allow them to be close to blood. She herself works as an ER nurse. Peter shows up with a box of his things, having previously made an agreement with Roman that he would be able to move in and stay at his place to give Destiny and Andreas some space. Olivia is taking care of Shelley and encouraging her to take some prescription medication. Shelley doesn't like how the pills make her not feel things but reluctantly takes the pills anyway. A man comes to visit Olivia, searching for Norman as he was a patient of his and recognised Olivia from a photo on Norman's desk. Peter is skeptical and weary of Roman bringing Annie into all the supernatural drama they have but it shocked when Roman reveals that she's also an Upir. Roman wants to keep Annie around, as he feels connected to her and also wants to take the opportunity to learn about how to function as an Upir. Peter then calls Destiny and asks her to come use her abilities to figure out what attacked them. Destiny eats a piece of broken glass from the scene and becomes frightened when having visions of the monster that attacked Roman. She coughs up the glass shard and is visibly shaken by what she has seen and also speculates that the monster went to the mortuary seen at the episode's beginning after attacking Roman. Olivia meets with the double-agent PI who shows her what he has found in his search for Spivak. When investigating Spivak's abandoned apartment, he found a war medal baring the name Ryan Dunbrack and upon further searching he found a photo from 70 years ago of the Ryan Dunbrack that looks identical to Spivak today. The PI doesn't know about the supernatural world so he presumes that the man is Spivak's father. Olivia then says she needs to tell the man the truth about Roman - looks like she'll be spinning some lies to turn him against Roman. Spivak is shown to have another woman hostage in a cabin in the woods along with Madeleine and baby Nadia. The other woman attacks Spivak by stabbing him in the neck with a fork and he in turn spits his acid saliva onto her face which then melts off. Afterwards, he throws her body down into a cellar. Spivak has been experimenting on Nadia in the basement, much to Madeleine's horror. Olivia shows the findings about Spivak to Pryce. She wants more nutrient but it isn't ready yet and Pryce's behaviour appears to be growing increasingly erratic. Shelley tries to commit suicide by strapping a chain around a tree branch to hang herself but when she attempts to do so, the branch breaks and she simply falls to the ground. Peter and Andreas meet with the Croatians to sell them the product. The deal goes well but afterwards, Peter is alarmed when he does the math and realises that Andreas has scammed the Croatians by tricking them into thinking there's double the amount of product then what they actually had. A specialist is brought in to verify that the product being sold to the Croatians is legitimate. He confirms that it's the real deal since thankfully he sampled part of the supply that was real. Roman and Annie bring Destiny to the morgue so she can try to track the monster. They feed on some of the blood stored in a vat while Destiny tries to sense anything that can help them. They are able to figure out that the mortician that was killed was an Upir. This means that the monster that attacked Roman is specifically hunting Upirs. Madeleine attacks Spivak by knocking him in the head with a candlestick. She grabs the keys so she can run outside and leaves Nadia behind, claiming that she'll come back for her before running out into the woods. She hails down a couple in a car and asks to use their cellphone. She sends a text message for help but then Spivak drives up. She wants to hide and stay away but decides to give herself over when Spivak begins playing with the couple's infant. He sees that Nadia sent a message for help and tells her to get in the car with other thinly veiled threats, tough the couple are none the wiser. Olivia visits the man that had come looking for Norman. She tries to attack him but appears to be too weak to kill him quickly and barely feeds on him at all. She later goes to Pryce to try to figure out what's wrong with her. He gives her a glass of blood but she can't seem to tolerate it. For some unknown reason, her biochemistry is such that she is having trouble consuming blood. It's a mystery of what she should feed on. Andreas reveals to Peter that the Tongue (the man who was in charge of verifying the authenticity of the caviar) was bought off so they could scam the Croatians. Peter is still angry at Andreas for putting their lives at risk which would've left Destiny alone without those closest to her. Andreas apologises and says that all the money he has earned is supposed to go towards building a life with Destiny. Annie confides in Roman that she once had a family but they died due to her being immortal and them not. Destiny then comes over and warns them that the monster is still there. Roman gets the text from Madeleine, which is hard to understand as she was distressed when writing it so it's a lot of capital letters and mostly illegible. But then they are attacked by the monster and Destiny is able to overpower it by injecting it with the tool used to drain corpses. Roman then begins to suffer from a seizure and the cause is unknown. Madeleine is brought back to the cabin and Spivak forces her to go down to the basement which she is terrified to have to enter. Olivia returns home and finds that Shelley isn't there. She is shown to have run away. Finally, the family that had pulled over for Madeleine are shown to be dead and frozen in their car when discovered by some local police officers.